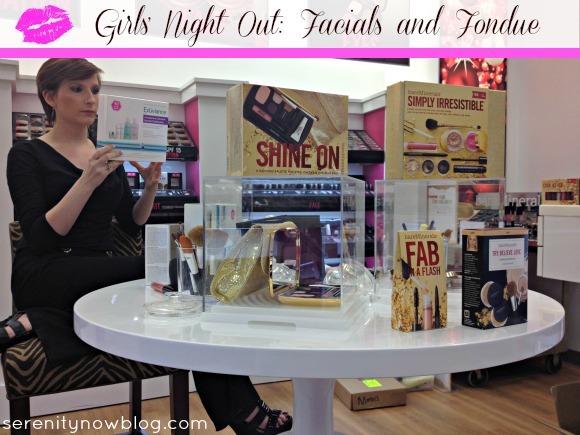 I had so much fun last Friday night that I just had to share a fabulous Girls' Night Out idea with you all: Facials and Fondue! Excuse the iPhone photos, but I was so excited to get out of the house, I didn't consider bringing my Nikon with me. My sister-in-law (SuSu) and I plan outside events for our local MOPS group, and we really wanted to do a shopping event for November. Unfortunately, our first choice (a very well known jewelry and accessory chain store) turned us down...for both a shopping event and a group discount code. Bummer. Not to be discouraged, I called my sis in Alabama and asked for a Plan B idea. She suggested stopping by our local Ulta beauty store. We did, and the response couldn't have been more enthusiastic. 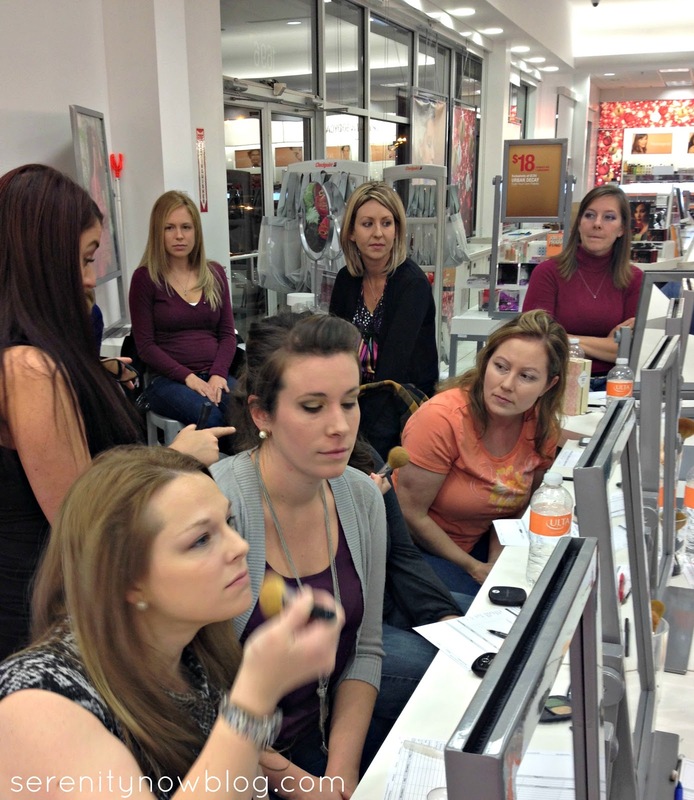 About 26 moms showed up at Ulta on Friday night; most of us with bare faces. I was completely freaked out about showing up without any make-up on, but excited about the prospect of trying some new beauty products. The reps from Ulta did a fabulous job of transforming the front of the store into a little beauty workshop. 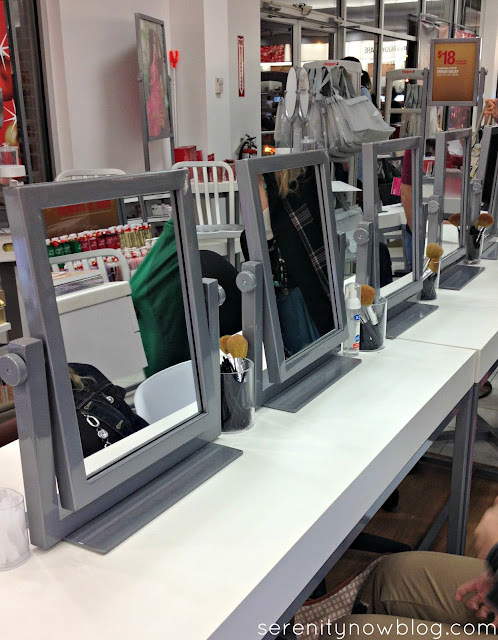 There were mirrors, make-up applicators, and skin care surveys waiting for us. 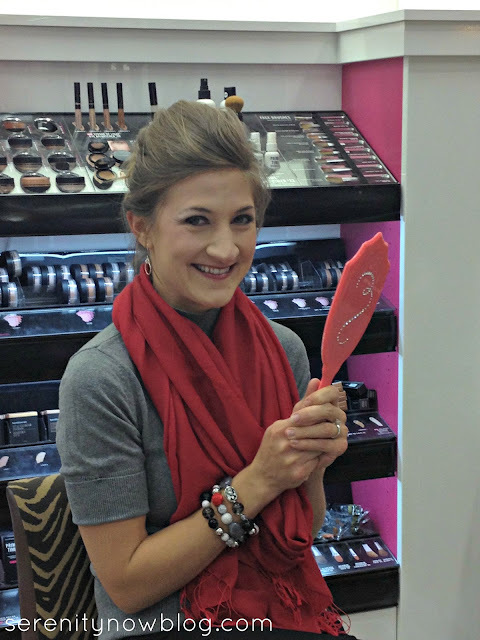 The line Ulta chose for us to work with was Bare Minerals, which I ended up not caring for...but it was fun to try out new things and watch everyone else get beautified. We learned some basic make-up application tips, and the rep offered a few ideas for changing up your look from Day to Night. She did a great job of explaining each product that we used, and they even offered us samples and a special discount on some of the starter packs. The moms had a chance to chat and shop after the workshop. And the best part? Ulta offered the class for FREE! Obviously, their hope was that moms would come in and shop (which we did), but it was so generous of them to offer a fun night out when many of us are on budgets in this tough economy. 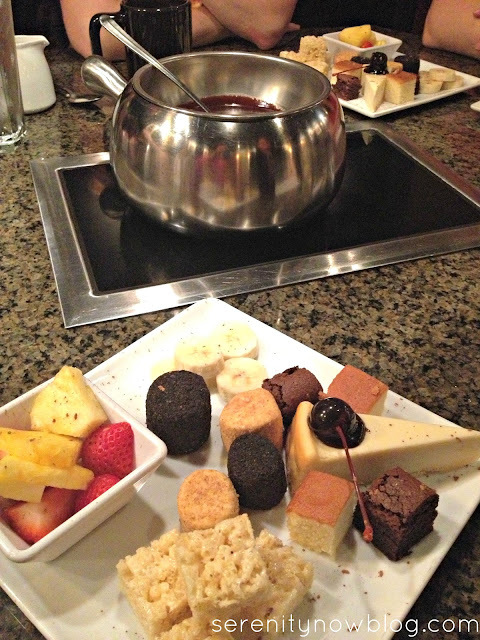 Any good evening is rounded out with a good dessert, and The Melting Pot didn't disappoint! The manager reserved a private room for our group, and each table choose a selection of chocolate fondues for the $8 special. The wait staff was most attentive, and willing to answer questions. My table ended up choosing the Flaming Turtle, Original (dark chocolate and peanut butter), and the Creme Brulee. Yum! Of course, events are no fun at all unless you're with a good group of friends. SuSu and I were pleased to see ladies mingling and chatting with people they might not connect with otherwise. I call that a success! Have you had any fun nights out lately? 26 people showed up! awesome! charming charlies totally missed the boat on that one! what goodies did you get? That is such an awesome idea for a girls night out. My friend and I started a Bunko group so that we could have inexpensive nights out. I beauty night at Ulta sounds fun too though. Especially, since I could use a little bit of make-up advice. I will have to suggest this idea tomorrow night at Bunko. That sounds like such a fun night! I would love to come to something like that! I may need to try and plan something similar! This looks like so much FUN! Really LOVE this idea and will keep it on my memory file! lol. Also, why didn't you like the bare minerals? It seems like everyone I chat to loves it, but I'm a little afraid to try something that's rather expensive. What a fun night! 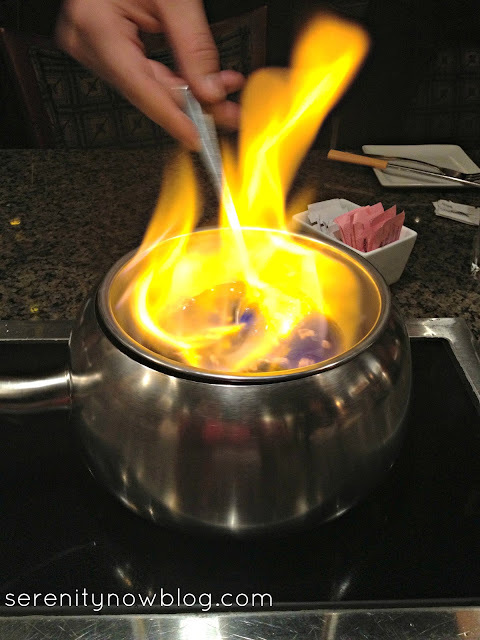 I absolutely LOVE the Melting Pot... so much that I've finally learned to wear my stretchy pants when I go there now! What a fun night! I've only been to the Melting Pot once and I decided then that if I went again, it would be for dessert. Yum! How cool!! The store that turned you down missed a great chance, I'd say--26 women in your store? Who wouldn't want that? Glad y'all had a good time. You have the best MOPS group ever! Wow that sounds like such a good idea! My sorority alum group is always looking for more cool things to do. We've done the Melting Pot but the makeovers would be something new!